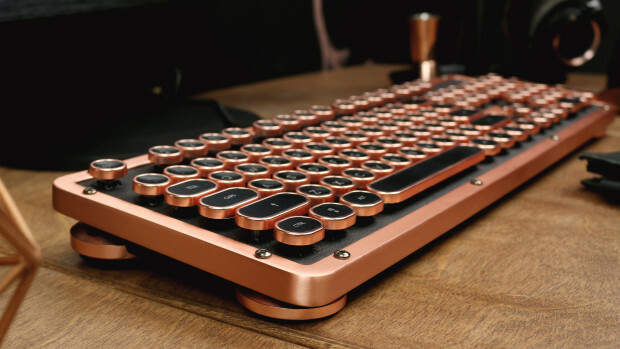 With over 17 years’ experience in the computer keyboard and peripherals industry, AZIO Corporation recently released a stunning new typewriter inspired mechanical keyboard on IndieGoGo. Azio wants to see this vintage typewriter trend grow, and they are primarily marketing to designers and professionals who work on a keyboard every day. This is a revolutionary crowdfunding campaign because this retro classic keyboard style has not yet been approached by other major manufacturers, and AZIO employing tactile Blue type switches beneath carefully crafted keys. Even the common LED indicators are tube-like white lit domes, embracing the retro feel. What Is The AZIO Retro Classic? 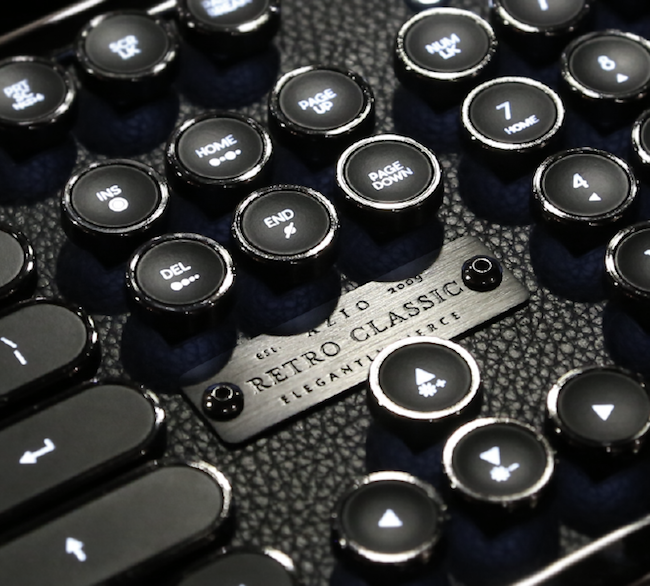 The AZIO Retro Classic is a mechanical keyboard that looks and feels like a vintage typewriter. This campaign has a working version of their physical product that successfully performs core functions. Genuine Leather, Metal Alloy, Backlit Keycaps. 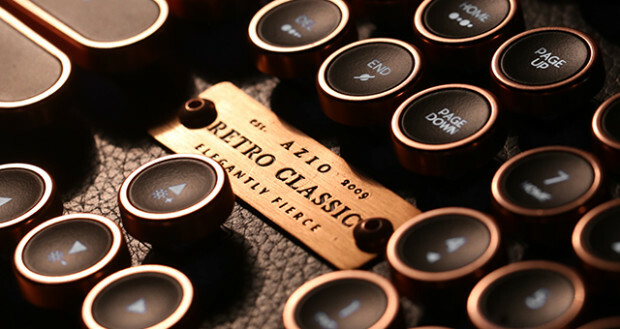 AZIO brings back the nostalgic vintage look and feel. 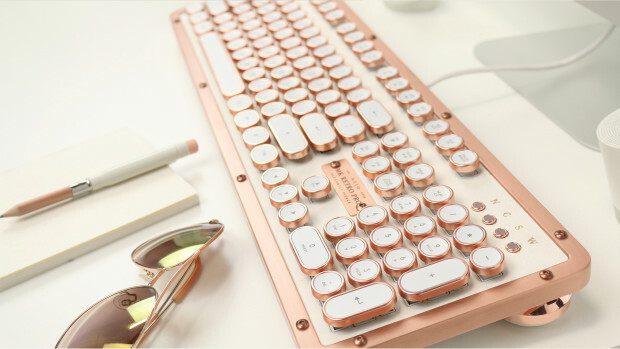 This keyboard is not just about a great piece of hardware, it is also about creating a positive, creative working environment. Through countless prototyping with different materials, AZIO settled on genuine leather for the top plate. 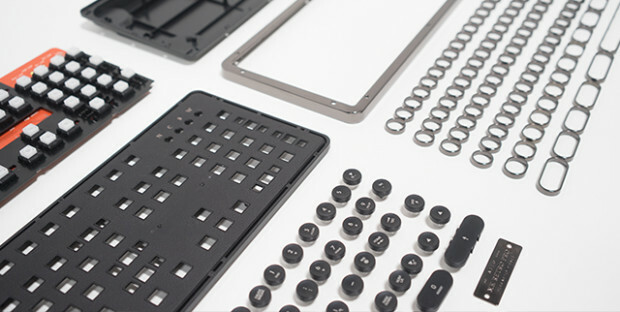 This gives AZIO keyboards a traditional, high-end and exclusive appearance that feels solid and responsive. It reflects taste, craftsmanship, and culture while emitting a unique charm that inspires the user. USB Wired or BlueTooth Wireless connection. Works for Windows or Mac (comes with interchangable key caps). Premium zinc alloy frame, genuine leather surface, spherical round key caps. Features pillar feet with adjustable height. Who Makes This Mechanical Keyboard? AZIO® is an acronym for “A to Z, Input-Output”, which is reflected in the core business as a manufacturer of computer & electronics peripherals. The AZIO brand logo employs a simple, geometric typeface to resemble solidity, efficiency, and forwardness. AZIO Corporation is dedicated to providing innovative tech gear to make everyday life more engaging and fun. They believe that design has the power to alter not only perceptions but alter emotions as well – so you can truly enjoy typing! Create cutting-edge products that are intuitively easy to use. Leave a minimal environmental footprint. AZIO strives to design their products with the perfect blend of elegance and ferocity through the use of bold colors, quality materials, and a crisp finish. Get the optimal balance between aesthetics and functionality! Previous articleTurn Any Piece of Paper Into A Custom Circuit – Circuit Scribe – NOW on Kickstarter!